And you can still buy Lamb Cake Pans, but I don’t promise that they contain my Grandma’s vintage lamb cake recipe (thus why you need to keep reading). My Aunt Squeak was super excited to find this old photo of her with the lamb cake, probably taken on her second Easter. Lamb Cake is Squeak’s favorite cake. She swears that the Bunny Cake that the Canadian Honker Restaurant in Rochester, Minnesota tastes just like Grandma’s lamb cake. Famous Bunnies Coconut Cake like Grandma Betty used to make! From Squeak’s recommendation, I tested the Bunny Cake out when Mallory had tests at Mayo Clinic, and I can vouch that it is delicious! Lamb cake from Easter 1983. I’m presuming by the off-centered photo that my mom took the photo. 🙂 Notice the jelly beans around the lamb. My grandma always had jelly beans or gum drops in her candy dish. My aunt made the lamb cake for Easter 2009, shown here with her grand-daughter. My aunt still has the original recipe for lamb cake with the lamb cake pans, although she said she cheats and usually uses a cake mix. Heat oven to 375 degrees. Grease pans well. Mix flour (which has been sifted and then spooned into cup for measuring), baking powder (double action) and salt. Sift together three times. Cream butter, add sugar, a small amount of time, and continue creaming until mixture is light and fluffy. Add beaten eggs and extract. Add flour and milk alternatively. Be sure to mix lightly and keep the batter smooth. Pour batter into FACE HALF of the mold. Fill to the top being careful to get batter into nose and ears. Left over batter may be baked as cup cakes. Place BACK HALF of mold on the top–bake face down–place on tray and bake from 30 to 45 minutes. Remove from oven after 40 minutes and gently remove back half to test. If done, replace back half and allow to stand for 5 minutes before removing the cake. If not done, replace back half and return to the oven for 5 minutes. When removing cake from molds, remove back half first and then the front half, carefully. Allow cake to cool standing erect. When the cake is cool, ice with a icing and cover with coconut. If desired, use 1/2 raisin for the eyes and a small piece of cherry for the mouth. For a white cake, substitute 4 egg whites for the 2 eggs and use lemon or orange extract in place of vanilla extract. 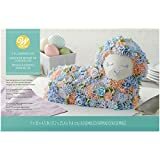 You can find Lamb Cake Molds for the best price on Amazon. Did your grandma ever make lamb cake for Easter? I still have the original paper that came with the lamb cake mold. 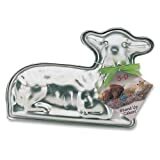 I just bought two lamb cake molds. I don’t know where to begin, but I can’t wait to get started!